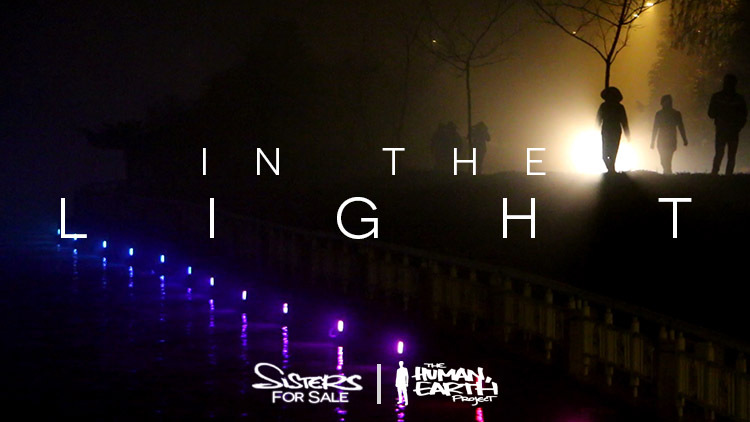 ‘Sisters For Sale’ is a unique story, with a unique power to shine a light onto the dark realities of human trafficking. Most people are now aware of human trafficking – yet the trafficking stories we are told are often impersonal, inaccessible, and oversimplified. ‘Sisters For Sale’, on the other hand, is a deeply personal story which exposes the true complexities of the issue, and makes it real. It’s a story that has proven its worth time and again on television and radio, in newspapers and magazines, on social media and countless blogs. A marketing expert looked over ‘The Human, Earth Project’ in the first year of its existence, when it had just 1,000 Facebook supporters. With the right marketing, she said, we easily could have had 10,000 supporters – even then, before we’d really achieved anything. After five years, and having achieved incredible things, we still don’t have anything approaching that number. It’s not because I’ve been promoting the project in the wrong way: it’s because I’ve barely been promoting it at all. Worse than that – I’ve actively resisted any serious promotion for years. Our Twitter and Instagram accounts haven’t been active in over a year. I’ll blog, and post to our Facebook account, maybe once or twice a month. That’s it. There are no fancy tricks on our website to help build our mailing list. I often shy away from opportunities to tell my story, and there have been times I’ve gone for months without handing out a single business card (though I’ve seen how powerful those personal contacts can be). Dear friends at The Human, Earth Project, you’re not loud enough… Your work and intentions are barely seen. That is because YOU’RE NOT LOUD ENOUGH. It’s true – yet I have my reasons, and they’re personal. In 2014, I achieved some rather unusual things, and became more personally involved in this story than I’d ever intended. It brought me further into the public eye than I’d expected, or am comfortable with. Maybe you’ve seen my TEDx talk, or some of the televised interviews I’ve done, and you think that’s who I am – someone who enjoys getting up in front of people and talking about themselves. Nothing could be further from the truth. I’m normally very selective about who I share my life with. Even here, on my blog, I share only what I feel is necessary. It’s true that I’ve deliberately sought a wider audience for my story at times – after all, the purpose of my work is to raise awareness of human trafficking. While I may not have initially realised exactly what “raising awareness” would involve, my story is currently the best tool I have to achieve that goal. I’ve received a very strong sense of resentment from some people, as if they want to be the guy telling the world they found their kidnapped friends in China. It’s a good story, and for some people, being that guy might be amazing. For me, it’s a role I’ve struggled with. Some people do seem to receive a great sense of self-worth and validation from the attention they receive, even from strangers on the Internet – and that’s fine. I am not one of those people. I’ll admit, I have enjoyed being recognised on the street by strangers, on the rare occasions it has happened. When those of you who have been following my story from a distance suddenly appear up close, in real life, it makes me feel that my work has had a real impact. It’s good to know that you’re out there in the world, listening. We have a common interest in this project, and I enjoy meeting you in person. Beyond that, what attention I’ve received from this project has only confirmed my desire for privacy. One criticism I’ve had of the documentary is that I’m barely present in the story, that I linger on the edge of frame. People have said they want to know more about me, and my role in the story. I’ll share more if and when I’m ready – but I’ve never been the focus of this story, nor do I wish to be. Perhaps it’s the filmmaker in me, who prefers to remain behind the lens. Perhaps it’s the traveller in me, who prefers to blend in. Perhaps it’s the Australian in me, with our culture of shooting down anyone who gets too big for their boots. Perhaps it’s simply that I don’t truly understand my own role in the story. Whatever it is, I’m just not the right person to promote this project. I don’t need the world to know about me – but I do want them to know about ‘Sisters For Sale’, and the two can be very difficult to separate. On the rare occasions I’ve made efforts to promote my work, I’ve often bungled it. At its core, ‘The Human, Earth Project’ is tiny – much smaller than many people may realise. I don’t test-market things. I don’t have the luxury of researching and refining my presentation before I share it with the public. I just do whatever seems right at the time – and sometimes it’s not right, but it is constantly getting better. I listen to people’s comments – and abuse – and adjust the message accordingly. You are the test audience. This project is an eternal work-in-progress, subject to continual refinements. There has a been a long process of trying to understand my own role in the story, and finding the right way to tell it. It’s very difficult to have an objective sense of something you’re so close to. Was your friends getting kidnapped the best thing that ever happened to you? That’s the kind of barb that sticks, long after the person who made it has forgotten all about it, and yet another reason why I shy away from promoting my work. But the work needs to be promoted: it’s time to bring ‘The Human, Earth Project’ into the light. I’m looking for people with promotional and social media experience to help tell this story effectively and powerfully to as large an audience as possible, while giving due respect and privacy to those involved. You might be that person (or you might know someone who would be perfect!). Perhaps you have only a little time to consult on strategy, or perhaps you’d like to be more deeply involved. Either way, it’s an opportunity to help share more of a unique and fascinating story which can make a very real difference against human trafficking. I can’t say yet when I’ll be able to share ‘Sisters For Sale’ itself – but there are plenty of other stories, images and videos we can share before then. ‘Mirei Op Reis’, and Matteo Damiani republished a previous interview in the first issue of the downloadable ‘Planet China’ magazine.